We gather this morning to celebrate the life of our gentle and beloved Sister Mary Clare Henry. 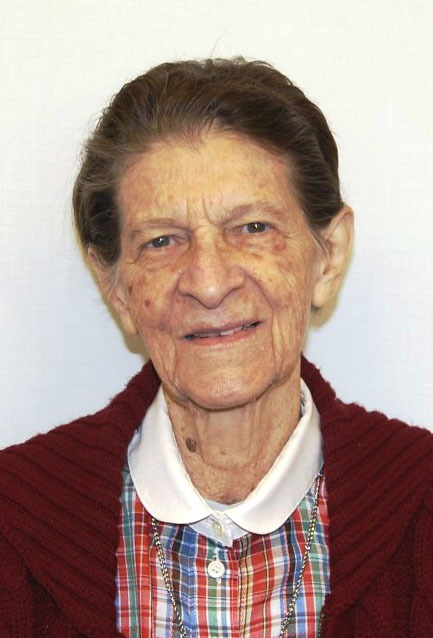 In 2011, after 57 wonderful years as a member of the Philippine Region, Sister Mary Clare Henry returned to Maryknoll, New York, for medical treatment. Sister became a member of the Chi Rho Community where, as long as she was able, she contributed generously as a very active member. On May 1, 2015, on the Feast of St. Joseph the Worker, Sister celebrated her entrance to eternal life. She was 87 years old, and had been a Maryknoll Sister for 64 years. Born on September 5, 1927 to William G. Henry and Anna Marie Weiss, of Weehawken, New Jersey. Mary Clare had five siblings, Joseph, Edward, William, and Rev. John Henry, SJ, and one sister, Catherine. Their father died when Mary Clare was one year old. Mary Clare graduated from St. Michael’s High School in Union City, New Jersey in 1945. She attended Notre Dame College on Staten Island from 1945-1949 earning a B.A. degree in Social Science with a minor in Education. She also attended Newark Teacher’s College. For one year, she taught in Palisades Park Junior High School in New Jersey. By this time, Mary Clare was 23 years old and realized it was time to answer the call resounding incessantly in her heart. She entered the Maryknoll Sisters on September 6, 1950, from St. Augustine Parish Union City, New Jersey, Diocese of Newark. At her reception, she received the name Sister Mary Anne William She made her First Profession of Vows on March 7, 1953, at Maryknoll, New York. She was missioned to the Philippines the same year, where she made her Final Vows on March 7, 1959, in Manila. Sister Mary Clare began her service in the Philippines with a year’s language study in Manila. She then taught English and religion in Lipa from 1954-1956, from 1956-1965 in Pakil (where she also served as regional assistant superior in 1960 and superior in 1962, in Lucena from 1965-1968, and Cateel from 1968-1971. She then taught religion and served as a supervisor for San Francisco del Monte High School, a public high school in Malabon from 1971-1972, followed by in congregational service at Maryknoll, New York. Sister Mary Clare returned to the Philippines in 1976, working as a CCD coordinator in Malabon until 1979, then in Quezon City until 1983. From 1984 to 1989, she served in Upi, Maguindanao, a rural area in southern Philippines helping a local pastor with the parish catechetical program, engaging in ecumenical work with the predominantly Muslim population in the area, and visiting villages of the Tirurays, one of the indigenous groups in southern Philippines. In 1989, Mary Clare returned to Maryknoll to serve as administrator and business coordinator for Maryknoll Mission Institute. She also did promotion work in local parishes. In 1994-5, she helped care for her sister Catherine, who had supported her mother all the years Mary Clare was in the Philippines. She lived with other Maryknoll Sisters in Burgos House, Quezon City, next to a village called Escopa, a high-density area, which is home to more than fifteen thousand informal settlers. This time she volunteered in a literacy program for differently abled persons at the National Vocational Rehabilitation Center in Manila. Reflecting on this ministry, she said, “I have been inspired by handicapped people who have accepted their disability and radiate cheerfulness. My students became my teachers.” She also met with a women’s group for gospel reflection and prayer and taught English classes to Asian women religious studying Scriptures and Theology. On several occasions, Mary Clare served in various leadership positions as superior of the local community in Laguna, on Finance, Personnel, Planning Committees, and on the Vocation Team. She was also a delegate to the 16th General Assembly. Having been diagnosed with cancer and undergone major surgery, Sister returned to Maryknoll, New York. In a note to the leadership team, she wrote, “My transition from the Philippine region to the Chi Rho Community has been moving along with much care and support for which I am grateful. I look forward to be in mission in new ways at the center. I saw a star to follow. We are happy to welcome with us this morning Sister’s brother Joseph, many of her nieces, nephews, grand nephews and nieces, and friends. We also welcome our Maryknoll brother, Father Jim Noonan, MM who also spent many years in the Philippine Region, who will celebrate the Liturgy of Christian Burial.